House made of spite? You don’t say! Have you ever seen an unusually narrow house wedged between two others? It’s possible it was a spite house, or at least the oddity that’s become known as a spite house. It turns out there’s a spite house here in Alameda (seen above). No one seems to have the straight story on the house – According to Zillow, a man sold off a tiny parcel of land adjacent to his house, thinking it was too small to build a home on. However, the buyer turned out to be a carpenter who began building a home on the site. The carpenter finished what would come to be known as the Spite House in 1890. It’s not much wider than a car. Wikipedia’s version of the story is different. It says that the city took a large chunk of Charles Froling’s land away to create a new street. Froling had inherited the land and planned to build his home on the site. To spite the city and an quarrelsome neighbor, Froling built a house 10 feet wide, 54 feet long and 20 feet high on the tiny plot that was left. 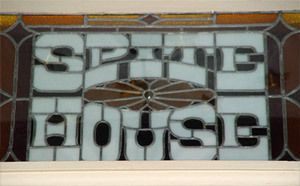 The house fell into disrepair in the 1960s after the elderly owner could no longer care for it, but new owners have brought it back, including installing this excellent transom window over the front door. There’s quite a few spite houses out there. I sincerely doubt that most of them were built out of spite, but it’s a catchy term. The New York times has a nice feature and slideshow on the Hollensbury Spite House in Virginia. Curbed and CNN spotlight Boston’s Skinny House. 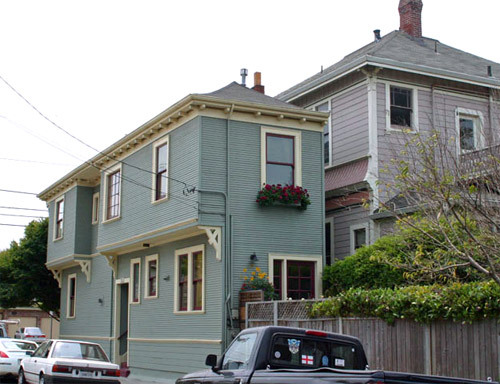 Twisted Sifter and Wikipedia round up a number of other spite houses. I love the idea of a tiny house and building creatively for the space you have, but blocking neighbors’ windows and access not so much. Wow, Charleston, SC is full of quite a few, and after a rather heated neighborhood dispute I did dream wicked dreams of putting up a fence on my property line making it impossible to actually access half of her house on the outside. But realistically, normal people only think these things, as I’d rather still be able to actually talk to my neighbor in person…not through our lawyers! More than any other factor when finding a place to live, I hope and pray for nice neighbors. We’ve been very lucky so far!